Due to my love of football from my parents, I watched a series called America’s Game. America’s Game was a series that profiled and re-caped the Super Bowl winning teams starting in 1966. While watching it I realized that the principles of playing football and the characteristics of “great” players were also the same in the Corporate world. My favorite “old school” players and coaches included Johnny Unitas, Vince Lombardi, Walter Payton, and Jerry Rice. The three biographies I chose to read and learn from were about Johnny Unitas, Vince Lombardi, and Walter Payton. These three individuals exhibited leadership qualities I wanted to embody. Teaching about teamwork and the how to allow your team to flourish I always talked about Vince Lombardi. Vince Lombardi was the best NFL Coach and if he lived in the 21st Century he would be considered the Manager that embodied the characteristics of a leader in the Corporate world. Besides their excellence on the field, they appreciated the gifts given to them and gave back. Whether it was taking the time to sign autographs, going to Mass, or establishing a charity they recognized life beyond football. Below is a brief summary of some of the characteristics each embodied that any individual could incorporate to they themselves be considered “great” in business and on the field of this game called life. Took Dance class: He went outside his comfort zone to build and develop skills based on what other legends such as Muhammad Ali did to become quick and fast. Business Lesson: Go and seek out other fields of industry and education to improve in your own performance He wasn’t afraid to seek out different methodologies. Other cultures and other areas of industry provide valuable better practices. You only have to look to find. Played with the flu and 102 fever: His love for the game, his passion and drive made him put physical illness off for a day. He used his mental toughness to get past his physical ailments. Business Lesson: Mental toughness is essential. You have a pain in your shoulder or you are sick? Go to the Dr. immediately and keep going. Vitamin C, orange juice, or whatever it is figure out what will help you feel better and get it done. Then, keep going. You can be sick tomorrow. When you have a job to do illness and “aches and pains” are minor. You can triumph anything with mental toughness and positive thoughts. What is your passion? What is driving you? What do you love? Your passion and positive thoughts will keep you healthy. You will do plenty of resting when you’re dead. Business Lesson: As an adult imagine yourself as your childhood hero. Your imagination will keep you going. When you get knocked down to keep yourself going IMAGINE you are the hero of your childhood. That hero won and so will you IF you keep going. Business Lesson: Don’t (over)celebrate successes and don’t dwell on failures. For every success you will fail again. For every failure you will succeed again. Maintain balance and focus. If you make a mistake, admit it and keep moving forward. Don’t dwell over failures. Have short term memory loss with mistakes. Keep your focus on your goal and keep going. Business Lesson: Don’t compete. Do your best and help your team whether it be a small team or an entire Company. Get over yourself and perform your best for others. Business Lesson: Practice or hone your skills in uncomfortable places:The conditions don’t make you great, your passion and love keep you going. Small desk? Dark room? Too quiet? Too loud? Keep focused on your end goal. If you keep focused on that you will get to better places and you will appreciate them. He was hardest on his players BEFORE the game. Once the game started he was the most useless person on the field because Bart Starr his Quarterback took charge- He instructed them, taught them, and put their nose to their grindstone during practice. During the game all he would do was yell or scream. Why? Because he allowed and trusted Bart to call the plays and take over. Business Lesson: In the 21st Century as a Manager, how do you become a leader? You give your employees the tools and resources they need BEFORE they start working. Then, you trust them and let them what they do best. If you trust them, they will respect your authority and perform their best for you. 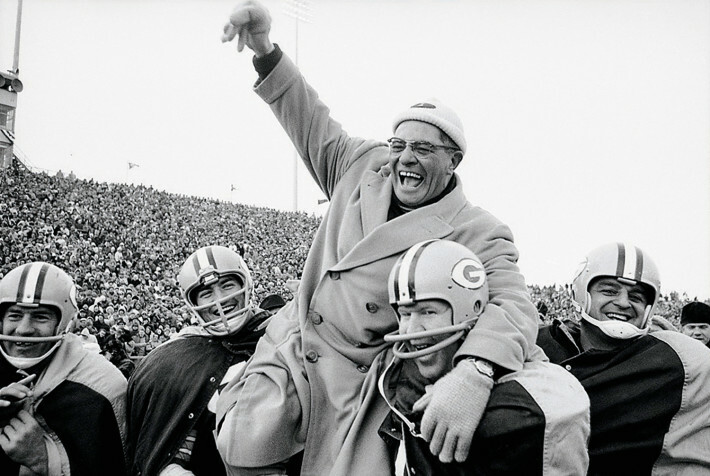 Green Bay Sweep: Vince Lombardi made the Packer’s easy to learn and made sure every player knew it blindfolded. The Packer’s Sweep was their speciality. The Packer’s Sweep was famous and there was no secret about hiding the play. Yet, the Packer’s still dominated and won. Business Lesson: Keep things simple and standardized. Perfection comes from standardization. Doing something repeatedly and executing the same way on a consistent basis equals success. Knowledge is power. In today’s society don’t worry about hiding information. Focus on working towards execution and perfecting performance. Competing is a waste of energy. © 2015 Deb Pfisterer Blog | This article was written by Deb Pfisterer and first appeared on her LinkedIn blog on 9 October 2015.